Toyota Motor Philippines is offering a new deal to help motorists choose and pay for a brand-new Toyota Vios or Toyota Innova. Customers can choose from any of the three promo packages to suit their budget. With the PAY LIGHT scheme, customers can get low monthly plans for as low as P6,500 for Vios 1.3E and P7,600 for Innova J Gas for up to 72 months, 50% down payment. With the PAY CASH, up to P35,000 savings are at stake for cash buyers. 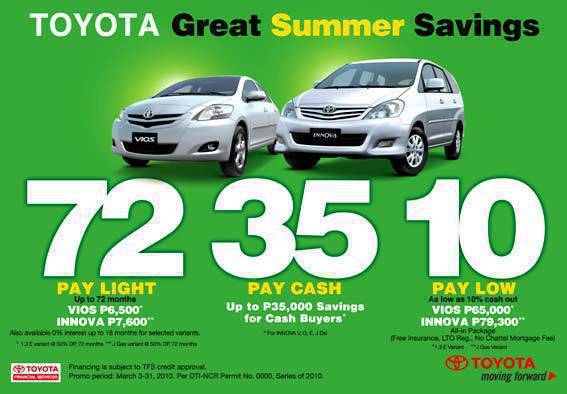 Lastly, PAY LOW scheme offers down payments of as low as P65,000 for Vios 1.3 E and P79,300 for Innova J Gas. In addition, PAY LOW customers are entitled to free 1-year Comprehensive Insurance, free 3-Year LTO Registration, free chattel mortgage and a free luggage tray. The Toyota Great Summer Savings promo runs until March 31. Toyota Philippines is the leading brand in the local market. It held a 35.1 percent market share with 8,041 units sold in the first two months of the year. In February alone, Toyota Philippines sold 4,170 units in the local market. The Toyota Vios dominates the market's subcompact category with sales reaching 1,110 units while the Toyota Innova continues to be the Philippines' best-selling multipurpose vehicle with 848 units sold last month.